A coordinated, multi-sectoral effort is essential to address chronic malnutrition and other dietary challenges plaguing the world’s food systems, according to the recent report, Nutrition and Food Systems, by the UN High Level Panel of Experts (HLPE) on Food Security and Nutrition. At the U.S. presentation of the report Jan. 18—organized by IFPRI, HarvestPlus, and the CGIAR Research Program on Agriculture for Nutrition and Health (A4NH)—participants focused on the growing worldwide problems of overnutrition. 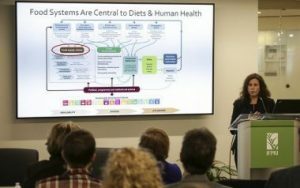 “As traditional food systems give way to the modern, epidemiology too is shifting from undernutrition to obesity,” said panelist Jessica Fanzo, lead author of the report and Bloomberg Distinguished associate professor of Global Food and Agricultural Policy and Ethics at Johns Hopkins University. Nearly 2 billion people worldwide lack key micronutrients, while 2 billion adults are overweight or obese, exposing the double burden of nutrition associated with food systems. Fanzo discussed how the burden of malnutrition differs across the three food systems: Traditional, modern and mixed. Traditional food systems have the highest prevalence of stunting, wasting and mortality in children under 5 years of age and vitamin A deficiency, whereas modern food systems report highest prevalence of adult overweight and obesity. Mixed systems, meanwhile, face both problems—a significant challenge for policy makers and development organizations. These multipronged issues can be addressed by integrating nutrition within national policies, programs and budgets; enhancing global cooperation to end hunger and malnutrition; and recognizing conflicts of interest, she said. “We have 12 years left of Sustainable Development Goals. Let’s make this the only decade of action on nutrition that we need,” Fanzo added. This post was excerpted from a blog by Smita Aggarwal, IFPRI Communications Specialist. Click here to read the full post, summarizing the entire event.